Three Very Beautiful Young Girls Teach Us All A Lesson About Life in "Grandpa's Girl"
Valley East Today invites all readers to share some of their fondest memories about living in this community. The following people have graciously provided us with some of their thoughts to share with others. We thank Monique Grenon of Hanmer for sharing some of these old photos that she uncovered from one of her albums. See if you can spot some of your old friends (or ancestors). Click on the link below for more photos. The four celebrated young talents, shown above in the photo that is at the front of their web site (click on the photo to link directly to the web site), are from left to right: Joey Niceforo, Paul Ouellette, Leon Leontaridis, and Giovanni Amenta recently joined to form DESTINO, whose name means “destiny” in Italian and Spanish. Before forming the group the four tenors, who have varied musical backgrounds including opera, gospel, R&B, soul, jazz, musical theater and pop, were pursuing successful solo careers – from singing at Carnegie Hall and for the Pope to a #1 radio single. After being hired to work on a project together, the men realized that they possessed a strong chemistry both on-stage and off. And with that, DESTINO was born. DESTINO’s style has been described as “pop with an opera flair … or vice-versa.” Born out of a desire to bring opera music to a wider audience, the style has been dubbed “popera” and is currently sweeping the musical charts, with singers such as Andrea Bocelli, Josh Groban and Il Divo selling millions of CDs worldwide. With the formation of DESTINO, “popera” now has Canadian representation. DESTINO’s members have received much critical and media acclaim. Insight Magazine said, “Joey Niceforo has one of the most robust and exciting voices I’ve heard in a long time. The bio about Joey Niceforo, who was born and raised in Hanmer, can be found on the web site: "Emerging young talent Joey Niceforo has been commanding attention in North America and Europe with his thrilling tenor voice. He made his professional signing debut in the Toronto Opera in Concert’s Canadian Gala Concert and has since performed several roles with them. He recently made his debut in the Czech Republic where he performed two operas with the Hradek Karlove Philharmonic Orchestra. He has also recently had the privilege of singing at a gala in New York City where he shared the stage with famed tenor Salvatore Licitra. In January of 2004 Joey made his film debut (as an opera singer) in an ABC family movie produced by Britney Spears and has also appeared singing on NBC. Joey was the recipient of the ‘Italia Nel Mondo’ award and, as a result; Mr. Niceforo had the honor of traveling to Rome to perform with Gigi d’ Alessio. Other distinguished award recipients were Covent Gardens conductor Antonio Pappano, and actress Sophia Loren. Just recently Destino signed a recording contract with Shoreline/Universal. They will now be included with several other successful artists such as Nickelback (their first album licensed), Barra MacNeils, George Canyon, Patricia Conroy and D-Cru. The new album is scheduled to be released in the summer of 2007. 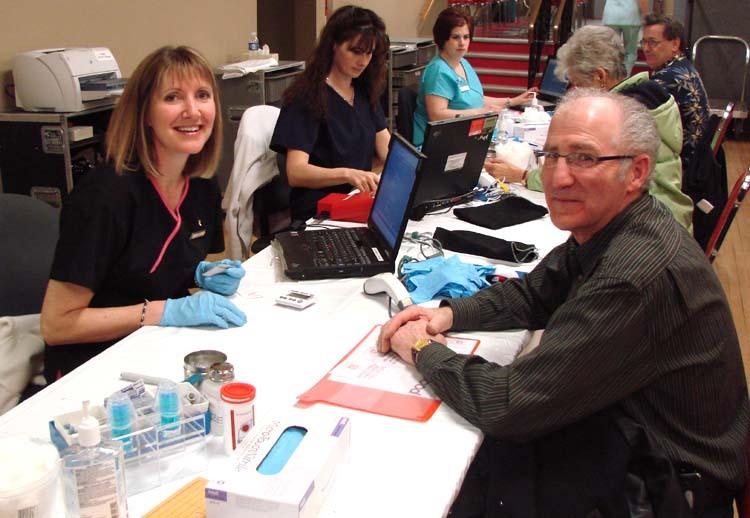 Robert Plourde, Co-Chair of the Blood Donor Clinic for the Knights of Columbus Council #5005, not only helps organize the clinic for the Canadian Blood Services staff, he also donates a unit of his own blood four times a year. In fact, Robert has been so faithfully giving this precious gift over the years that on Wednesday, March 21, 2007 , he joined the “Century Club” for blood donors. In the photo above, he is shown with Clinic Assistant, Jeannie Chamberlain, going through the 'Tech Registration' part of the process. Everyone must go to this table to register and have a blood sample taken which will go through screening and testing before any of the donated blood will be used. This is Jeannie's 14th year with Canadian Blood Services. 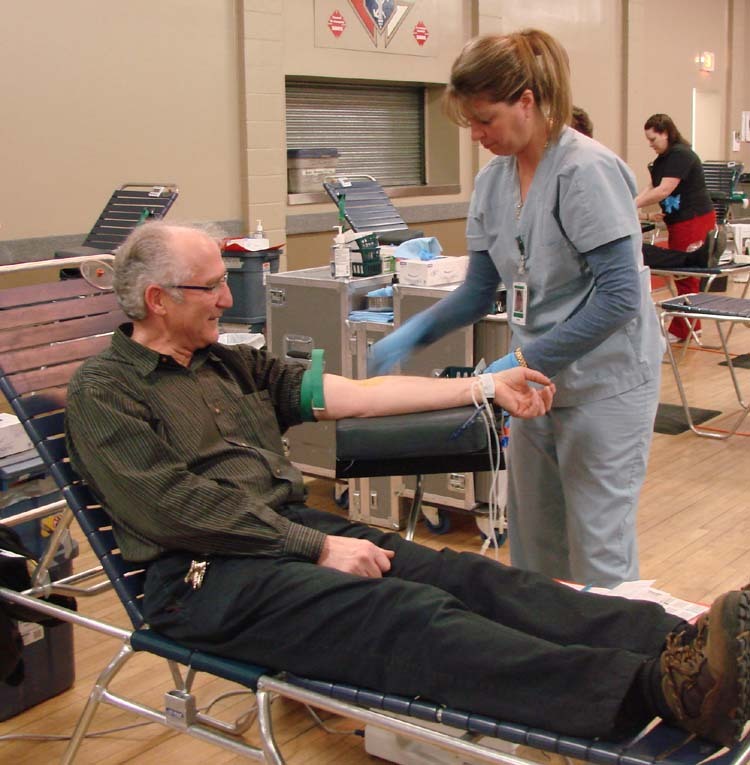 In fact, except for a period of seven years while he was working in Timmins , Robert has been extremely consistent in donating as often as he possibly could. Now, at the age of 59, he has achieved a goal that few people would ever reach. 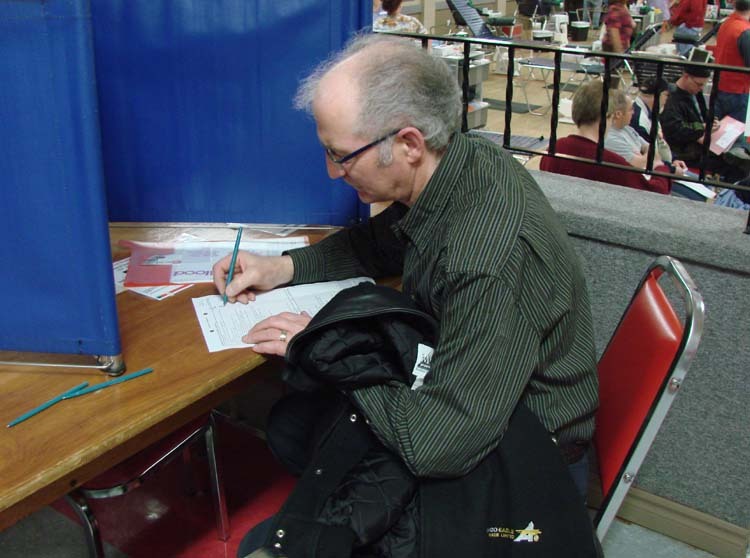 Above, Robert is shown filling out a personal questionaire with information about his past medical history and current health conditions. 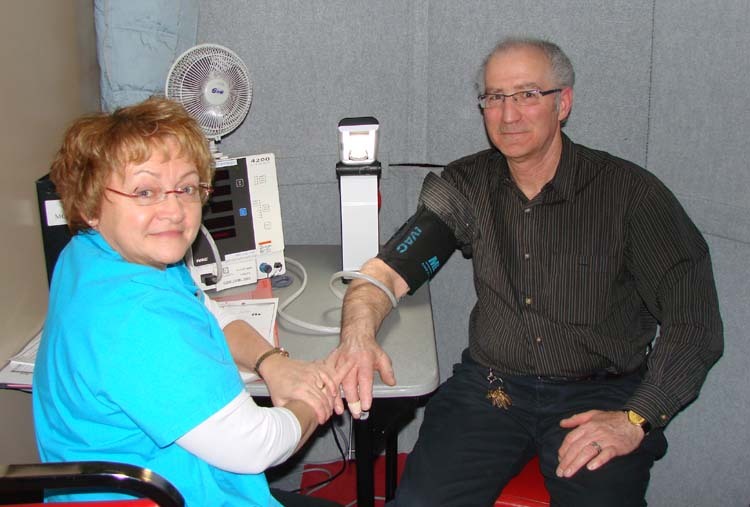 Gail Fong, a Registered Nurse, is shown with Robert inside one of their private cubicles where Robert gets his blood pressure tested and reviews his information sheet. Gail and the other Registered Nurses are responsible for screening candidates and making sure they are appropriate for donating blood. After finishing up with Gail, Robert is cleared to meet with Phlebotomist, Robby Kirkwood, as final preparations are being made to take out the 100th unit of blood from his left arm. In fact all 100 units have been taken out of Robert's left arm. Robert says he is proud of his accomplishment and he wishes more people would consider donating blood several times during the year. According to Robbie, "We take about 1/10 of the blood from your body when we remove a unit of about 450 ml during this process. After three months your body will have had plenty of time to replenish the loss and you can safely donate again." Robert's blood type of A+ is one of the common ones, found in about 36% of the population. Type O+ is found in 38% of the population. It usually takes less than one hour to go through the whole procedure. You cannot contract and diseases from donating blood and you can make donations again every 56 days. and Hockey Canada. They are participating in a nationwide search for outstanding hockey volunteers. According to Shelley Lepp Fransen or the RBC Local Hockey Leaders Program, Thirteen regional RBC Local Hockey Leaders 13 winners from across Canada will be selected in February (one from each of the Hockey Canada branches) and each will receive $10,000 towards a local minor hockey cause. Some of the nominations that have been submitted have been set aside that demonstrate true local leadership. Robert (Bob) Bellerose, President of the Valley East Minor Hockey Association, was one of those nominations. 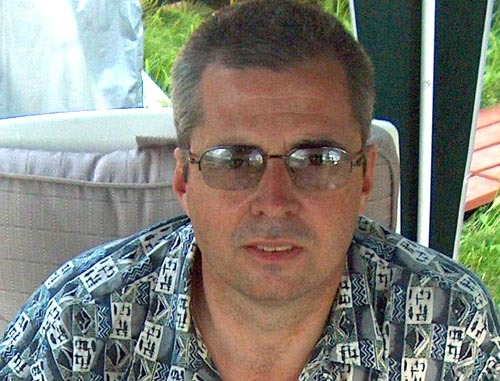 He was nominated by his son, Michael Bellerose. Ms. Fransen stated, "It is people like Bob who continue to make hockey a Canadian tradition. It is our hope that the community will be able to recognize him for his tireless efforts towards minor hockey. It is our goal to highlight the true behind-the-scenes hockey leaders that put their time and effort into making hockey fun and accessible for Canadian kids." Bob Bellerose is very dedicated to volunteering for Valley East Minor Hockey. He is the President of the league, and has been for approx 5-8 years. Before this he was the convenor of the novice division for approx 2 years. He demonstrates dedication not only by the number of years he has been volunteering, but also when it comes to tournaments, scheduling, assisting anyone in need, coaching, or anything that really needs to be done he is there to assist and complete the job. He can be easily approached by anyone. He is one of those people that can take criticism well and at the same time he can also be approached for anything that needs to be asked. He can answer any questions you may have if he knows the correct answer of coarse. He must be by far the person that dedicates his time to any sport just for satisfaction that kids are having fun and are developing. That is his main priority, Kids first! His helpfulness to the game of hockey in Valley East is exquisite. I do not think anyone would have a bad word to say about Bob because he demonstrates all the assets a leader needs. He is the best leader/volunteer that anyone can ask for. The positive lasting impact that Bob has given me is that helping out is very important. Life is not just about making money. You can have fun when you are volunteering. Since he has volunteered so much to hockey it has given me the love of the game. Since that I am too old to play I am an assistant coach of an atom tier 2 team and the timekeeper coordinator. Without his motivation and support I would not be able to do any of this. He has impacted the board/group because when the city wanted to do something that Bob did not like they backed him up. He has the respect for all board members because they respect how much time and effort he puts to volunteering. When I was in novice he was my coach. He was probably the best coach that I have ever had. Although I was really young I still knew how much time and effort he put to help coach the team. He even went out of his way to book gym at schools so we can have dry land practices to develop our skills. We might not have been the best team but having him on the team made it the best years of hockey of my life. Last year was my last year of hockey with the Valley East Minor Hockey. 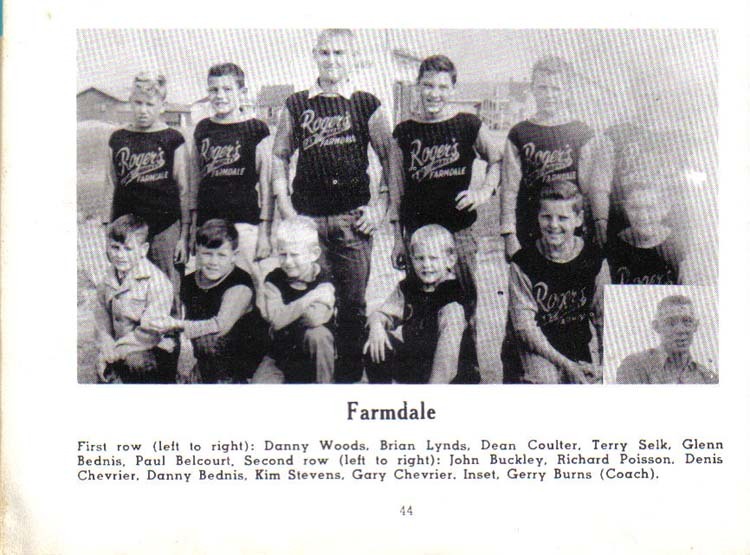 My dad (bob) was the assistant coach. He ran practices, scheduled practices, got us into tournaments; he was very dedicated to helping out team. It was really nice to see it once again. He volunteers THOUSANDS OF HOUSE but people take this for granted now that he has been around so long so I feel that he should be merited for all the volunteer work he has done for the game of hockey. As you may see this is my dad. I am too old now to play houseleague hockey is the valley because I am now 18. He is still the President of the league and still demonstrated all the assets that a leader needs. He has everyone riled up for next year because they know that he will be there and if they need help they know for sure that there is at least one person they can go see and ask anything they desire. John Brown, owner of "The Connoisseur", otherwise known among these circles as "The Coin Guy", can be found every month at the Hanmer Valley Shopping Centre with his display of coins and memorabilia. 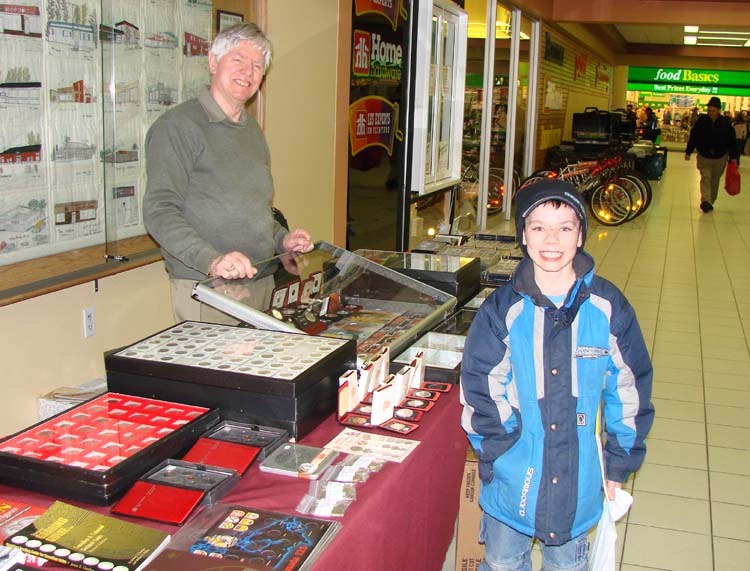 Coin enthusiasts from around the area, and as far away as North Bay, regularly visit with John to talk, trade and buy collectors' items of all kinds. Young William Gagne, an eleven year old collector, was one of the visitors to John's exhibit recently. William, who is a Grade 5 student at Ecole Notre Dame in Hanmer, has been collecting coins all his life, an interest that was started by his grandfather. John will spend hours talking to visitors about coins. "Besides learning so much about the history of different countries, this can be a great long-term investment for anyone," he explained while holding up some bills that were worth thousands of dollars. 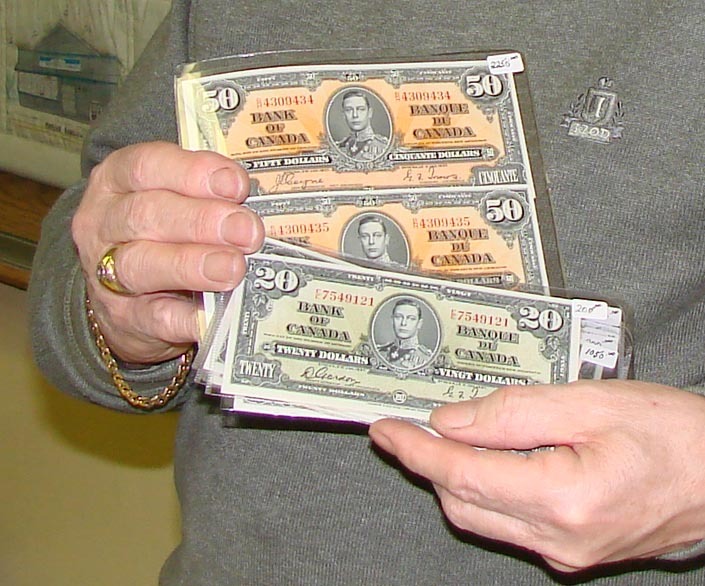 The two 1937 $50 bills in his hand are valued at over $2250 because of their mint condition and the fact that they contain two consecutive serial numbers. "You can imagine how hard it would be to find two bills in mint condition with consecutive serial numbers. The value of these bills will just keep climbing every year, so even if a person buys it now for $2250, you know you will make your money back and much more when you sell it some time in the future." John mentioned that some people have sold their complete coin set and made enough money to buy a house. This is especially the case for people who start collecting when they are very young, like William. "The value of coins and bills depends a lot on their condition," he explained. "Many people think the older a coin is the more valuable it is, but that isn't always the case. Coins that are misprints or during years when there were very few of them produced are more valuable. And the better the condition, the more valuable they become." Many coin collectors explain that they were started on the hobby at a very young age and just kept at it, accumulating interesting coins from different countries and different sets over the years. "You would be amazed at how much money has slipped through your pockets over the years," John explained. "Coin collectors get into the habit of examining all of the coins they receive to see if there is anything special about them or if they have any dates that are missing in their collection. Some go to the bank every week to buy rolls of coins and then check the coins to see if they can find any that they can use. Quite often a very valuable penny will be mixed in with the rest and instead of paying hundreds of dollars from a coin collector, you can pick it up at face value from the bank. If you have a set of every single penny that was produced by Canada in the 20th century, you can imagine how valuable that would be to some collectors. And you may be able to build that set simply by checking pennies from rolls you buy at the bank." Check out the Calendar of Events schedule for the Hanmer Valley Shopping Centre to find out when John will be back in the Valley with more coins and stories to tell. Monique Val Alphen, one of our local Hanmer residents, sent Valley East Today some information about some friends of theirs who have just recently decided to settle in Valley East. Denis and Velma Laplante, shown on the left, originated from Iroquois Falls and Timmins. They have spent the past 15 years living in St. Catherines. On September 29, 2005, Denis and Velma put everything they owned in storage and embarked on a 128 stop tour of Northern Ontario that brought them all the way back to Hanmer on Monday, September 4, 2006. You can visit their web site to see some photos and memories that they collected during their tour. They parked their trailer in the driveway of Monique and Jim Van Alphen and after a few days decided that this was where they wanted to settle down. On September 8, Denis announced on his web site, "Tomorrow we will sign a rental agreement in Capreol. Capreol will be our new home town. It is a Northerly part of Sudbury. This will be a start of a new life style. It seems like a nice friendly area and is close to another friendly area Hamner where our friends live. We will visit my dad in Iroquois Falls for his birthday and then head back to St. Catharines to say good-bye for now to our friends there and pick up our furniture and stuff." Apparently the Laplantes will be staying in Capreol until they can find a new permanent home in Hanmer. Monique Van Alphen commented, " I think it speaks volumes that after touring our vast beautiful country they have chosen the valley to call home. They really like the warm friendly community feel and are excited to get to know the area. I think they are great candidates to receive a Welcome Home gift basket from the Hanmer Valley Shopping Centre, which I feel is a wonderful way to extend our open arms to them in our community." JoeAnn's Market Research Group was in the mall from September 7 to 9 conducting research on household product usage by local residents. JoeAnn Corneau, shown above has been involved in this type of work for many years now and is contracted by large international companies to conduct market research on new and existing products. Interviews usually take no longer than 15 minutes and participants are given some small token of appreciation for their time and cooperation. Market research results are very important in the marketing and distribution of all products, so the information collected by JoeAnn and her assistants is extremely useful. 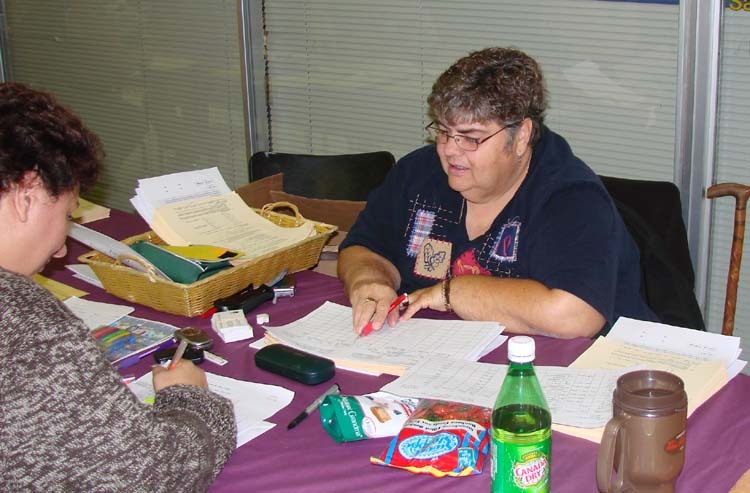 The next time you see JoeAnn in the mall, stop by and see what type of research she is involved. Your input may be needed. The President's Choice Children's Charity is dedicated to helping children who are physically or developmentally challenged. We provide direct financial assistance in the purchase of mobility equipment, environmental modifications, physical therapy and more in an effort to remove some of the obstacles that make everyday living extremely difficult for these children. Loblaws founded the charity in 1989 and has since raised in excess of $15,000,000 and helped over 3,500 families across Canada. Anyone with a child or young adult under the age of 25 with a physical or developmental disability can apply for financial assistance through this program. Just stop by Neil's Independent Grocers and talk to Neil for more information. This past year, the staff at Neil's Independent Grocers held barbecues, walkathons, skateathons, draws, fish ponds and cake tables, raising over $10,000 for the President's Choice Charity. In recognition for its efforts, two local families received grants through the program. 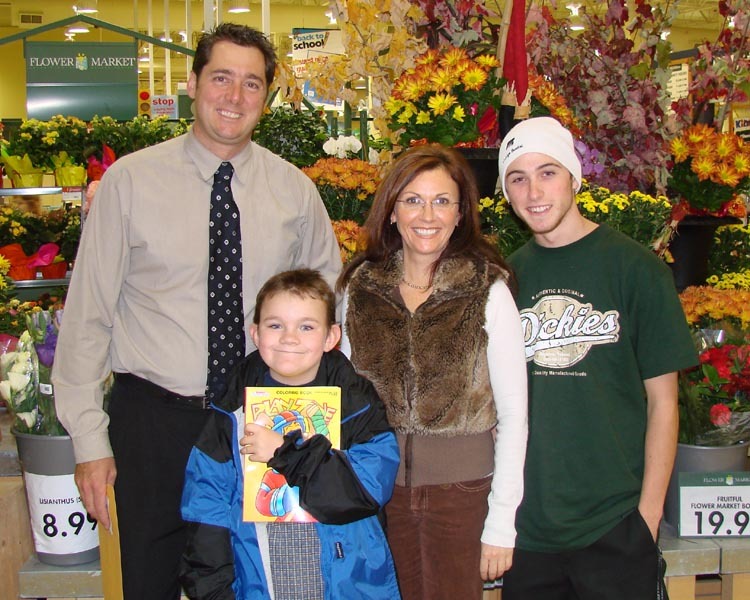 In the photo above, Neil Lindenbach, owner of Neil's Independent Grocers, is shown with the Poirier Family of Hanmer. Claire Poirier is a single mother, raising three children. She is in the photo with two of her children: Francois (18), who attends Grade 12 at Ecole Secondaire Hanmer, and Isaac (10). Anik (6) was at home at the time of the photo. For Claire, who was born and raised in Valley East, being the mother of an autistic child, Isaac, means being always unsure of the future. 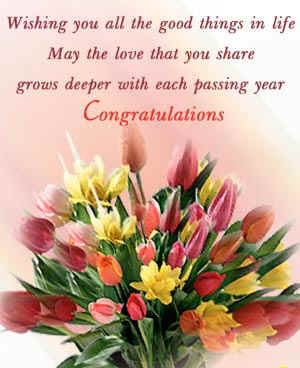 "Each day is a new day and you just don't know what it will bring. Isaac attends school at Ste. Marie in Azilda because it is the only school I know of that offers a special classroom for autistic children. He is extremely hyper-sensitive and takes a long time to adjust to changes in his routine, so I find that being in this class is good for him at this time." It is quite difficult raising three children as a single mom in the first place, but having an autistic child brings with it even more challenges. Claire holds down two part-time jobs as a nurse so that she can take more time off if needed to attend to Isaac's requirements or to catch up on some much-needed rest. "Francois is a great help to me," Claire declared. "I also need to hire help from time to time." The grant from the President's Choice Children's Charity will be used to erect a fence around Claire's property in order to ensure that Isaac remains in the yard and doesn't venture off without telling anyone where he is going. This has always been a safety concern for the Poirier family and having the fence is going to make it much easier to allow Isaac to enjoy playing in the yard. Neil is extremely proud of his staff who are always willing to take part in fund-raising ventures to assist in the ultimate goal of raising money for this worthwhile charity. "To have two grants in the same year is really quite remarkable and will certainly help motivate my staff even more." Roger Chevrier was once again in the mall for his regular performance of his unique finger-style guitar music at the Hanmer Valley Shopping Centre. Roger will be at the mall on the first Saturday every month from 1:00 p.m. to 2:30 p.m. at the Centre Court sitting area. He is also expected to add a few more special days to the schedule as it gets closer to Christmas. His next session will be on Saturday, December 2, 2006. 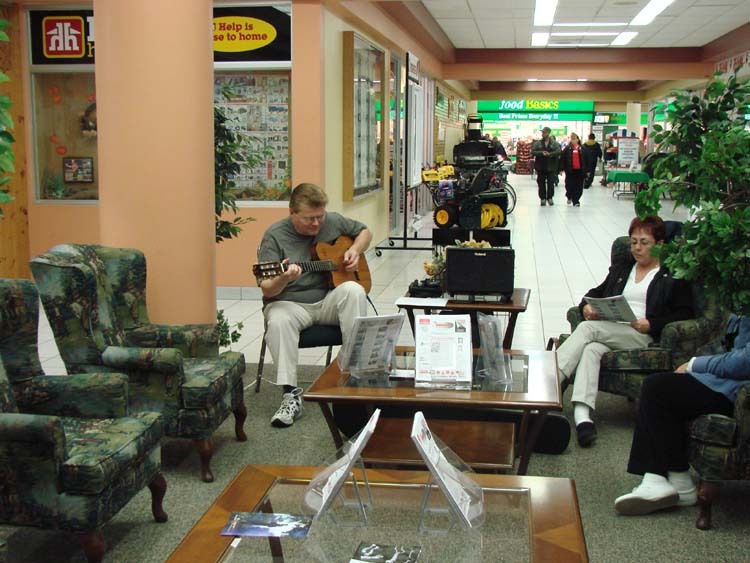 Shoppers are always welcome to stop by to take a break and listen to this relaxing music. If you have a guitar at home or if you love this kind of music, pick up an information pamphlet and find out how you can become involved in this wonderful part of the music industry. 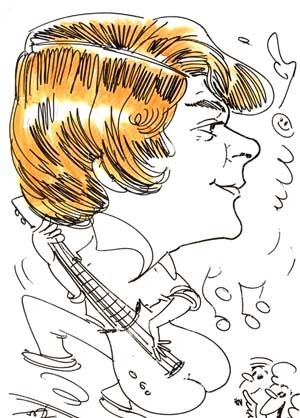 Roger is hoping to find enough guitar playing enthusiasts in the area to form a small club which may be able to meet once in a while to share some music and perhaps perform as a group in the mall. You can catch Roger on the Laurentian University Radio Station at CKLU 96.7FM every Tuesday and Sunday. On Tuesdays from 6 p.m. to 8 p.m. Roger is host of the show, "My Picking Parlour", while on Sundays from 10 a.m. to 12 noon the show is called "Sitting Back Picking". 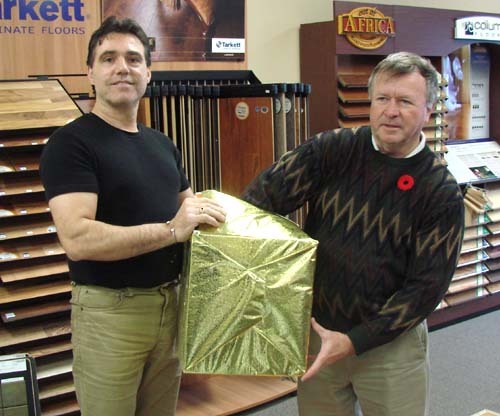 Ron and Bernie Pedneault, owners of FANTASTIC FLOORS of Val Caron, shown standing on the left in the photo, are pleased to announce the establishment of the Fantastic Floors Customer Charity Contest. The contest is open to all customers of Fantastic Floors who have flooring installed in their new home or those who are doing major renovations of at least $8000 in an existing home. Out of every fifteen (15) customers who qualify one home owner will win a prize of $2500. In addition, five different charities identified by those customers will each receive a $500 donation from Fantastic Floors as part of the contest. Renee (Lauzon) Leblanc, shown standing on the far right in the photo, and her husband, Rob, recently moved into a new home in Val Caron with their 20 month old son, Brayden. 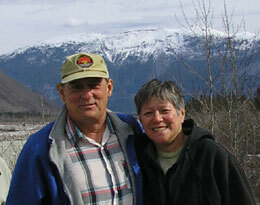 They were the lucky winners of $2500 in the first contest draw which was held on Saturday, November 11, 2006 . The Leblanc’s selected LA PORTE DES EAUX/ THE WATERGATE, a Christian organization located on Pioneer Road in Sudbury as the recipient of the charity donation from Fantastic Floors. 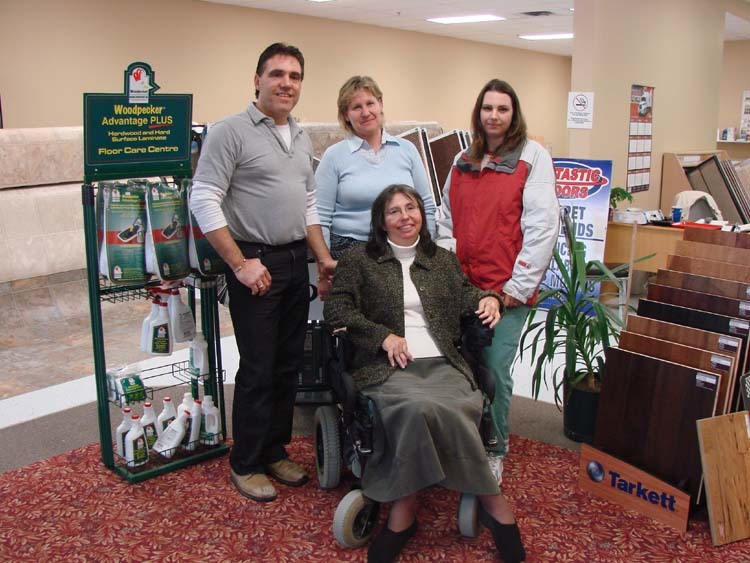 Because this was the inaugural draw in the FANTASTIC FLOORS CUSTOMER CHARITY CONTEST, Ron and Bernie decided to contribute the entire $2500 to this worthwhile organization, which was represented by Lina Madore, President, shown seated in the photo. Future contests will see five different charities each receiving $500 donations. 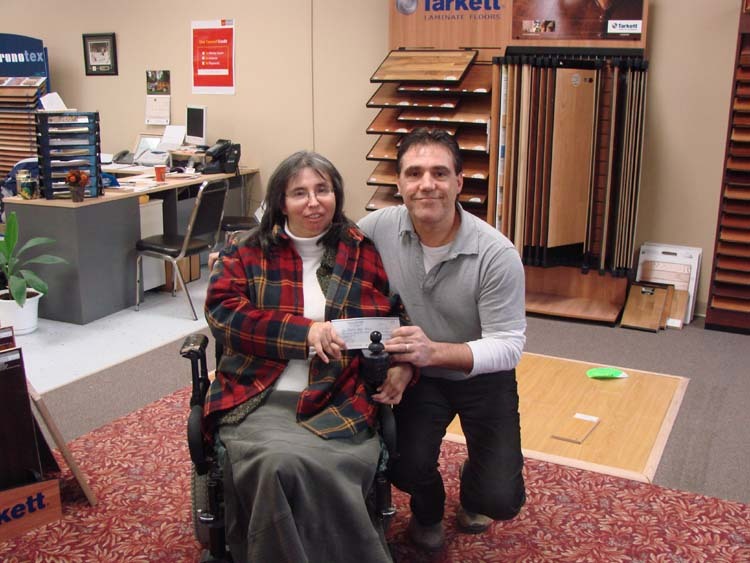 Lina Madore expressed tremendous gratitude to Fantastic Floors for their generousity. "This will really help us get through the winter months." LA PORTE DES EAUX/ THE WATERGATE is operated entirely by volunteers. It is located in the old Ecole St. Mathieu building at 1534 Pioneer Road in the south end of Sudbury. The organization has a library that is open to the general public and conducts workshops and conferences for both adults and youth. They distribute food, clothing and furniture to needy families. A bible study evening is offered once a month as well. If you would like more information about the organization, simply call 523-1437 or drop in Monday to Saturday from 9 a.m. to 9:30 p.m. 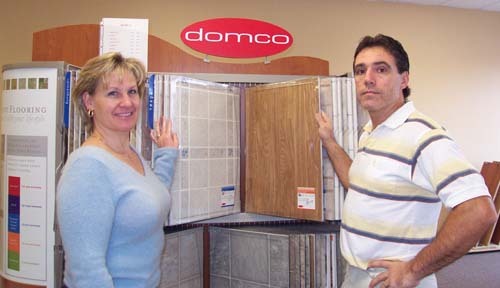 FANTASTIC FLOORS has been in operation for a little over a year and already has established a solid reputation throughout Valley East and Capreol as well as the rest of the Sudbury area for its quality products and customer service. The draw for the contest was made by Robert Kirwan, Publisher of Valley East Today, on Saturday, November 11, 2006. 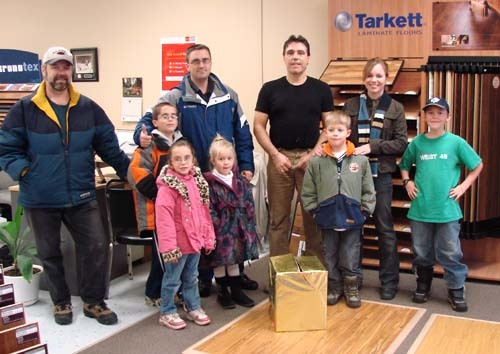 Some of the people who were on hand for the official drawing of the first winner of the FANTASTIC FLOORS CUSTOMER CHARITY CONTEST are shown in the photo on the right in the store. Each of the customers expressed total satisfaction with the products and service they have received from Ron and his staff. FANTASTIC FLOORS is open Monday to Wednesday, from 9 a.m. to 6 p.m. ; open late until 9 p.m. on Thursdays and Fridays, and; open until 5 p.m. on Saturdays. When you stop by for a visit, be sure to ask about the FANTASTIC FLOORS CUSTOMER CHARITY CONTEST. Capreol's Joyce Sweezy, shown on the right, is well-known for her love of life and for playing practical jokes on her friends. So one day she made a proposition to the Joanne Lafond, the owner of Dixie Lee Restaurant. Joyce told her that she would bring in the "Real Dixie Lee" in return for a free dinner. And so, one day Joyce enticed her good friend, "Dixie Lee" (McKenny) to come to her for a ride to the Hanmer Valley Shopping Centre for dinner. The "Real Dixie Lee" was not only treated to dinner, but she was even given a hat to take home with her "name" on the front. 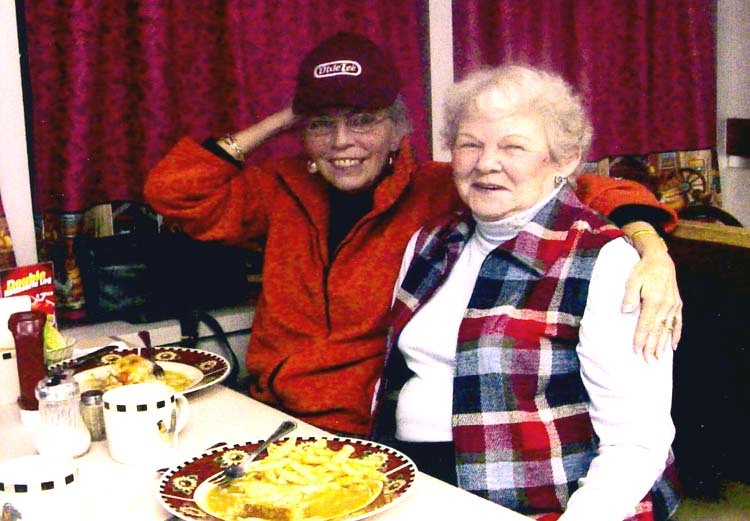 For "Dixie Lee", the surprise dinner was a great way to spend time with her "Aunt Joyce", and for Joanne Lafond, it is a great story to tell her future customers. Robert and Valerie Kirwan took some time out of their busy holiday schedule to "walk the streets" of Valerie's home town of Creighton Mine. Walking down the remnants of the once busy streets brought back memories of days when life seemed so much simpler, and yet, in many ways, much more fulfilling. The Kirwans first met in the spring of 1968, in what was known as the Creighton Club Recreation Centre. He grew up in Lively, a company town located a few miles up the road, and Valerie was born and raised in Creighton. They were married in 1972 and have lived for the past 34 years in Val Therese. The Town of Creighton no longer exists, after having been leveled to the ground during the 1980's. As they walked along the streets the Kirwan's commented on how small the space seemed to them now, and yet this small space once contained hundreds of houses, all occupied by employees of INCO. 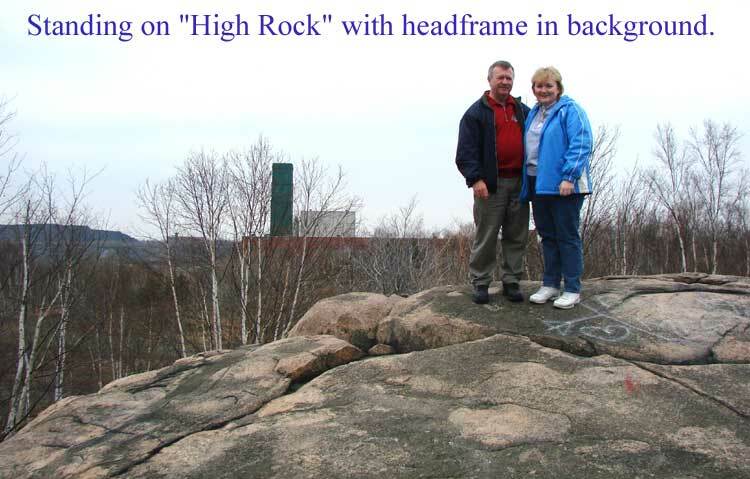 In the photo above, Robert and Valerie stand on "High Rock", a name given to the rock that was used as an all-season playground for Valerie and her friends as they were growing up. In the background you can see one of the head frames at Creighton Mine. Those were the days when you made your own fun. When creativity and ambition was common among all young people. When playing outside for hours on end without "store-bought" toys was simply "what you did" as a kid. 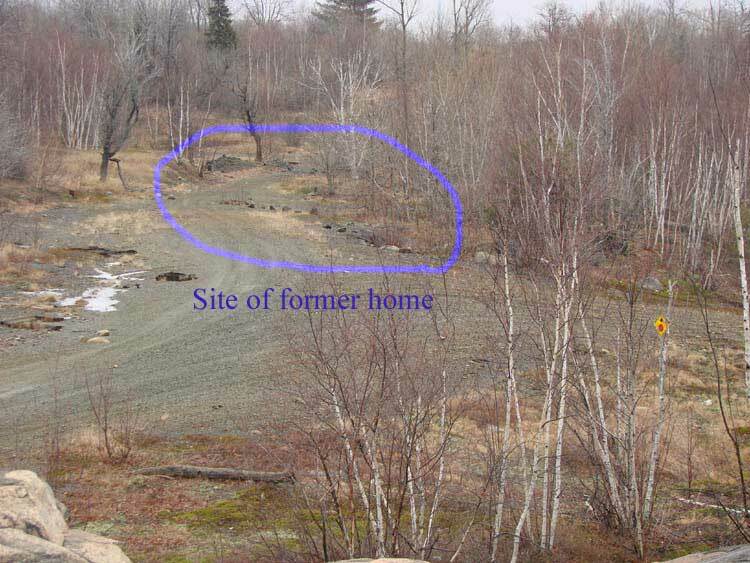 Below, in the space contained within the circle, is where Valerie's home once stood. Some of the rocks that lined the walkway beside her home still remain, but the road now cuts right through the spot that was once the living room. The house was small by today's standards, but it was all that the family needed to enjoy a happy existence among friends. Just to the left of the circle in the photo above you can see where the "original street" once wound around Valerie's house. Several months before Robert and Valerie ever met, Robert was driving around Creighton with some of his friends when they decided to turn around and backtrack. When he backed the car up, his bumper hit a large rock that was beside the road, making a loud banging sound (but not doing any damage to the car). Valerie remembers her father going to the window to see what was going on and then returning back to his chair with the comment, "Just some teen-age boys." It's strange how life works out. Over 38 years later, one of the teen-age boys in that car is still living with her. I know that there are many former Creighton residents who receive Valley East Today every week. If any of you have any stories about the days when you lived in Creighton we would love to have you send them to us so that we can share them with our readers. 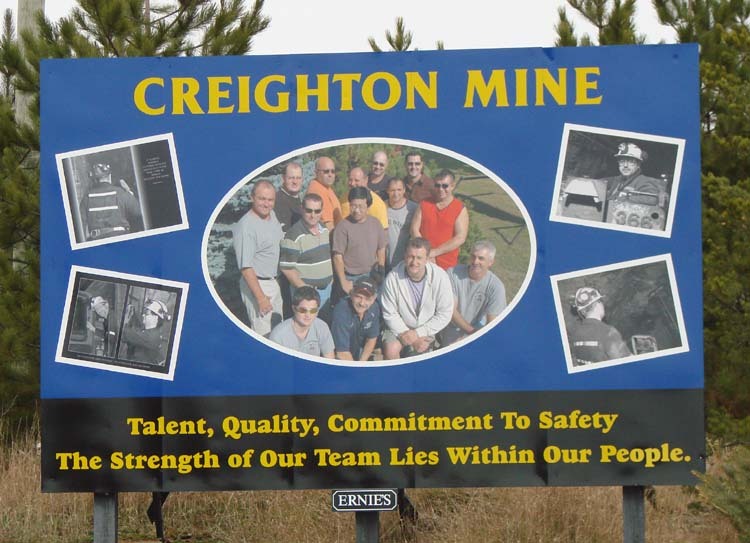 Send along a photo or two of the "old days" so that we can show others just how much community spirit existed in Creighton Mine. It certainly was a wonderful life back in the 50's and 60's growing up in the company towns of Creighton and Lively. I regret that our own children couldn't benefit from the same experience. I would recommend that you visit the following web site that has been created and managed by Audrie (Jamieson) Brooks, a young lady who lived at 48 Wavell Street (Snob Hill !?!). I am sure I went to school with her husband, Earl Brooks. Audrie and Earl moved to Thompson Manitoba in 1976 with their two small daughters. 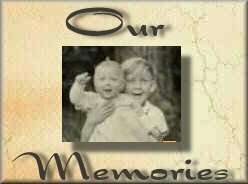 It is a fantastic web site with some great photos and memories. We look forward to your stories and hope you enjoy Audrie's web site. 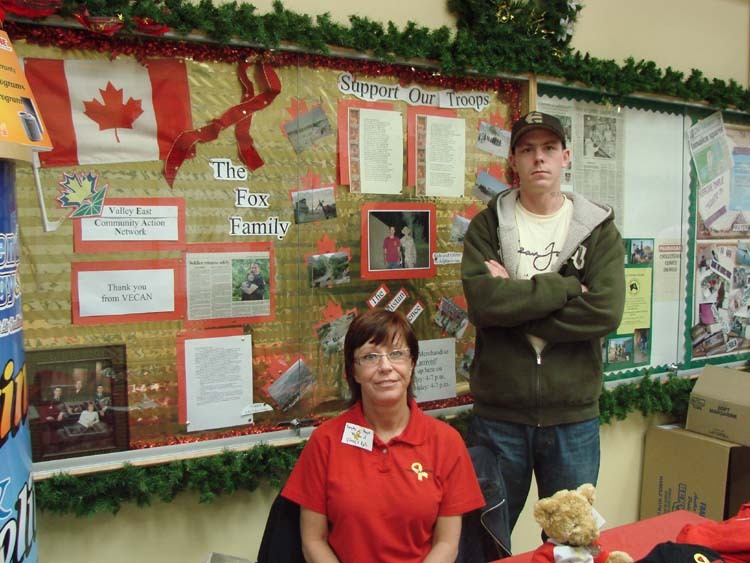 Sandra Amyot and her son, Kyle, 23, are shown in front of the special bulletin board which has been created by the Valley East Community Action Network to pay tribute to the members of the Canadian Armed Forces who are serving in Afghanistan. Kyle and his bother, Glenn, 28, are both members of the armed forces and both have seen action in this war-torn segment of the globe.